Liao Yiwu performed his poem, “Massacre,” forcing open the memory and aftermath of the Tiananmen Square killings of 1989. 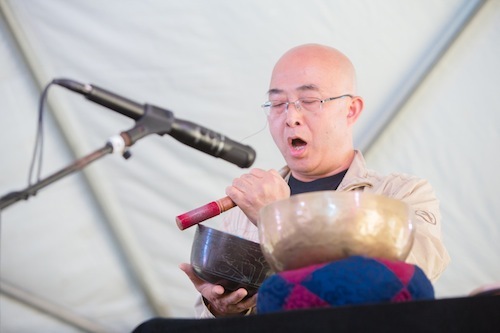 He follows this reading with a musical performance with his singing bowls. Paul Guggenheimer, of Pittsburgh’s NPR, read translations of Liao Yiwu’s The Corpse Walker before sitting down with the author and engaging the audience in a conversation about China and freedom of speech. Liao Yiwu is a Chinese author, reporter, musician, and poet, now exiled in Germany. His new book, For a Song and a Hundred Songs: A Poet’s Journey through a Chinese Prison tells the story of his imprisonment for writing poetry and film-making. Selections from his book of interviews, The Corpse Walker were first published in The Paris Review. He has received numerous awards, including a Human Rights Watch Hellman-Hammett Grant and a Freedom to Write Award from the Independent Chinese PEN Center.